There was an article awhile ago on Walter Schweitzer and the role he played in state government which I talked about. It was in a small paper and I have been waiting for the larger media to pick up on the story and see where it goes from there. I finally see the larger media in the state has picked up on it. I see a lot of the same things in this story that I did the earlier story but since this is a larger paper they got access to the Schweitzer brothers and we heard from them. Gov. Schweitzer downplayed his brother’s role, saying Walter has little or no role in the administration. This quote is early in the article. If you don't read the whole article you would think the whole thing is on the up and up and think the question has been answered. But later in the article you see a little more that makes you question the Governor's statement. Last fall, before the December 2005 special legislative session on school funding, Walter helped guide negotiations on what sort of funding deal would be acceptable to the administration. On the day before the special session convened, Walter presented the proposal to Democratic lawmakers meeting at party headquarters in Helena, according to a lawmaker who attended. He also took part in meetings at the governor’s office this summer with energy industry officials hoping to do business in Montana, said Rep. Alan Olson, R-Roundup. Olson, who supports Gov. Schweitzer’s efforts to foster coal development in eastern Montana, said he’d spoken to some of those officials after the meetings. The Governor says that Walter has no say on policy but he directed the negotiations on school funding and briefed Democrats on what was acceptable to the administration. That sounds like policy and not campaign to me. You also see he was a major player in the energy policy the Governor has been proposing. Again policy items and not campaign items. I also note that there are still reports in this article about people being scared to talk to media because they are afraid of retaliation from Brian and Walter. I was hoping not to continue to see these reports but here thy are. Democratic lawmakers, who didn’t want their names used because they feared retribution from the Schweitzer administration, said they’ve attended policy and strategy meetings at the Capitol in 2005 and early 2006 where Walter seemed to be directing the meeting. “If you just went to the meetings and didn’t know he wasn’t on the payroll, you’d assume he was on the governor’s staff, helping guide policy and strategy for delivering it,’’ said one lawmaker. Two members of the Montana Film and Television Advisory Council, which was scrapped by Gov. Schweitzer this year after a political spat between the council and the Department of Commerce, also said Walter called them to tell them they’d been dismissed as members. Is such fear a normal and good part of a Democratic process? For lawmakers to fear the administration is bad news. Instead of free and open debate we get people scared to speak their mind for fear the administration will punish their district. Not a very Progressive way to Govern if you ask me. I will quote myself from the last time around here. "Accountability and access. Montana has a tradition, enforced by law, of public access to our Government and accountability for it's actions at all levels. Walter, working in the shadows, betrays this tradition in Montana and the Governor needs to realize this. Either Walter needs to be moved into the spotlight and made accountable for his actions or he needs to go home and let the Governor lead the state as he is supposed to. The voters of Montana elected the Schweitzer and Bohlinger team to lead our fair state, not the Walter and Brian Schweitzer team. Hopefully our Governor will act quickly on this issue and resolve it." Accountability and access. I don't think that is to much to ask for. Those apologists out there that think fear, intimidation, and lack of accountability are the way to run our government really need to think about this a little more. This is a beautiful state that learned a lot from the corruption, fear and intimidation of the Copper King era of politics in the State and we don't need to revert to that. I sincerly hope the Governor will take heed of this. I understand how it is when you work with somebody close to you, you begin to think alike and sometimes you don't relieve how much assistance that person is giving you and how much you delegate to that person. I think that is what is happening here. I don't think it's a conspiracy or something like that. I think it's happened without either Brian or Walter realizing that it has happened. Brian has relied on his brother for so long it doesn't seem wrong to him. Maybe it isn't wrong, but it does violate the spirit an intentions of the laws our Government works under. The Governor needs to step back and take a long look at all of this and consider how it seems to other people. The appearance on impropriety is sometimes worse than any actual impropriety and that is what is going on here. Whether there is any thing wrong with what Walter is doing, too many people are seeing something wrong. Maybe Walter should consider moving back to Chester and distancing himself from the Governor for the good of us all and to put the appearance of impropriety to rest. This would help Governor Brian Schweitzer face this legislative session with out this problem hanging over his head. Just a thought that I know will be ignored by all. Yeah, that was a pretty cr*ppy original post, I admit. I've always clamored for transparency in this issue. So I wrote <a href= http://4and20blackbirds.wordpress.com/2006/12/11/on-the-helena-irs-coverage-of-the-walter-schweitzer-story/>another post</a> on the subject, ripping the IR piece to shreds. I'm a fan of the Governor, and have no problem with his brother making policy. (I am, after all, a partisan hack.) I just think it needs to happen above board as part of the usual process. Thanks for calling me out. I should have considered the story longer before writing anything on it. You don't give this kind of scrutiny to a wife of a politician who intervenes in the same way...it is assumed that first ladies will have influence over their husbands. Is it any less inconceivable to think that there are still families intact enough to help each other without financial renumeration? Walter seems to be doing what every good farmer's brother does..help each other out irregardless of money. Are you actually suggesting that the governor, who everyone knew was entwined with his family should stop because he got elected? Get real! That is the same kind of thinking that has broken down family values across the country. Brian was elected and we all knew what we were getting...just as much as anyone who marries can see ahead of time if their inlaws will be running the show. The real question is, with the advisors Brian has, whether or not they are paid, is he producing for our state? I say YES. Everybody around here knows I don't like The Governor particularly, but if you look at what I wrote closely, you see I give him the benefit of the doubt. I truly don't think they see they have crossed a line that gives an appearance on impropriety. They are family close and don't see the problem, others think there might be problem. I truly believe that this issue will dog the Governor throughout the upcoming session is he doesn't do something about it. If Walter is going to work on Campaign stuff that's fine, he needs to quit chairing non-campaign committees and doing other business for the Governor that doesn't directly involve campaign issues. This isn't too much to ask and it will only help the Governor in the long run. You need to more carefully read what I say, I never said it was wrong for the Governor to talk to his family, but for them to conduct state business gives an appearance on impropriety that is not right and not in keeping with Montana's idea of open government. Well, QO, I do think there's a difference between talking things over at home and having that relative actually sit in and lead public policy meetings. 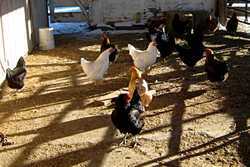 The chickens enjoying the warm sun and dry ground on the cement pad. They are really laying now. We are getting over a dozen eggs a day. Now to try to figure out what to do with all the eggs. Taken 1/4/2008.